Last week, many people were affected by Hurricane Michael, which devastated cities and towns across the southeastern part of our country. Seeing how the storm affected the people of Florida, our PDQ Gainesville Operating Director Matt Wade wanted to do something to help the community. 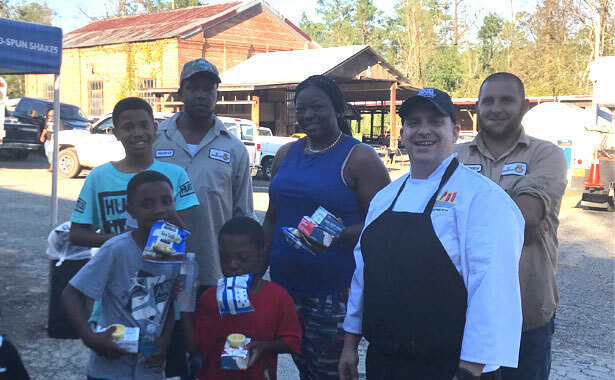 After receiving special assistance from Davis Gas Company in Gainesville who filled up the propane tanks, Matt and one of his awesome team members, James, packed up the PDQ food truck and took the three-hour drive up to Chattahoochee to feed First Responders and anyone in need of food. Matt and James met up with the hard workers from Gainesville Regional Utilities and followed their convoy north. After arriving to Chattahoochee the day before the town received any other assistance, PDQ was honored to cook and serve 1,000 meals that included our hand-breaded crispy chicken tenders, chips, homemade sauces, and PDQ bottled water. “It was a very humbling experience and everyone in the town was so thankful to have someone cook for them," said Wade. "I think it gave some sign of hope for everyone who has been affected by the devastation." Our team returned back to Gainesville around 2:30 AM after a fulfilling day to prepare to open the restaurant as usual in just a few hours. Thank you Matt, James, and PDQ Gainesville for your commitment to helping the community and being People Dedicated to Quality!